Happy Saints: Way of the Cross Picture Book (Paperback)! 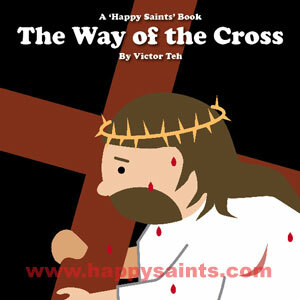 Due to repeated request for paperback version, I am pleased to announce the availability of the Happy Saints Way of the Cross Picture Book! A full-color prayer book that is great for homes, schools, religious classes, parish events and libraries! Take a prayerful journey with Jesus during His last moments on Earth. From the creator of Happy Saints, this prayer picture book features full color artworks of the traditional Stations of the Cross. Suitable for all ages.